Our recent study shows that NTBs implemented worldwide between 2010 and 2015 have been responsible for roughly 16 percent of the decline in global trade. The Ministerial Conference of the World Trade Organisation, convening in Buenos Aires from December 10-13, should therefore put a strong focus on tackling NTBs. Tariffs are the most visible instrument for protecting domestic companies against foreign competition. So-called non-tariff barriers to trade (NTBs) are less visible. NTBs include import quantities, registration formalities for imports or state aid for domestic suppliers. Our recent study shows that NTBs implemented worldwide between 2010 and 2015 have been responsible for roughly 16 percent of the decline in global trade. The Ministerial Conference of the World Trade Organisation, convening in Buenos Aires from December 10-13, should therefore put a strong focus on tackling NTBs. The 11th Ministerial Conference of the World Trade Organization will take place in Buenos Aires from December 10-13. It is due to the results of past WTO meetings that the importance of tariffs as barriers to trade has decreased in recent decades. This had a positive impact on the development on global trade. At the same time, however, more and more countries are resorting to non-tariff barriers to trade. NTBs are diverse and range from restrictions on the quantity of permitted imports to special technological requirements through to state aid for domestic companies. The trend towards implementing NTBs has increased substantially since the financial and economic crisis 2008/2009. The “Global Trade Alert Database” records newly implemented NTBs worldwide since the beginning of 2009. Until July 2017, a total of more than 5,600 new protectionist policies were adopted in the indicated period. More than 3,000 of them were NTBs. Since many of these policies are no longer in force at the present time, the number of NTBs still enforced in 2016 was roughly 2,400. In 2009, the first year covered here, there were just under 390 NTBs. Generally, the increasing implementation of NTBs is a worrying development since, just like tariffs, NTBs slow global trade and thus the economic welfare of countries involved. In fact, the development of world trade has lagged behind expectations in recent years (fig. 1). 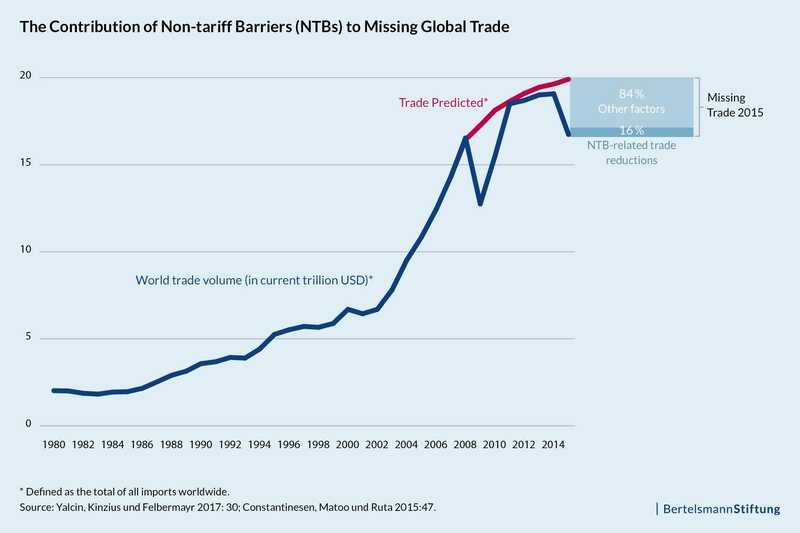 The calculations of the ifo Institute Munich on behalf of Bertelsmann Stiftung show that the introduction of at least one NTB on average for all countries and products leads to a decline of up to 12 percent in imports between the countries affected (i.e. the country adopting the policy and the country whose exports to the policy-adopting country are affected) over the analyzed period from 2010 to 2015. The effects differ across sectors, though, ranging from an average decline of about 26 percent in the natural resources sector to a decline of about 10 percent in consumer and non-durable goods.. The average effect of NTBs of 12 percent, as calculated above, can be transferred to global trade, defined as the total of all imports worldwide. This produces the following estimated amounts: the volume of global imports in 2015 was reduced by 3.1% or about 512 billion USD due to the NTBs newly implemented worldwide between 2010 and 2015. This corresponds to about 16 percent of the decline in global trade in 2015, which the World Bank estimates at 3.2 billion USD. It is important to note, however, that it is much more difficult to assess the effects of NTBs on international trade than to assess the effects of tariffs. Among others, this is due to the fact that the NTBs identified here are very different in nature. Therefore the strength of their impact can also be very different. For example, a newly introduced documentation obligation with regard to technical quality requirements for an imported electric shaver has a different economic impact than a policy where the quantity of permitted automobile imports is restricted to just 70 percent of the import volume in the previous year. Therefore, the effects of newly introduced NTBs on international exports and imports discussed below are only a rough approximation of the economic impact of these protectionist policies. If all the NTBs implemented worldwide between 2010 and 2015 had not been introduced, German exports in 2015 would have been about USD 43 billion higher than they actually were. This amount corresponds to roughly 1.2 percent of Germany’s GDP in 2015. German imports would have been roughly USD 34 billion higher if these trade barriers had not been introduced (roughly 0.9 percent of German GDP in 2015). It should be stressed that the figures for Germany are conservative estimates since German companies are confronted by NTBs more often than other countries due to their high export activity. 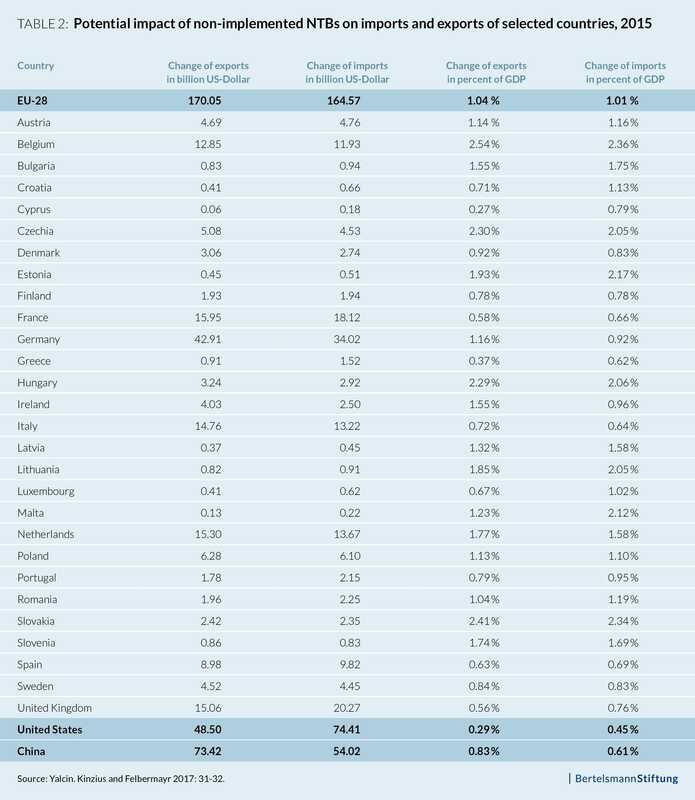 In absolute terms, the calculated declines in exports are only higher than Germany in the United States and China, at just over USD 49 and 73 billion respectively. In percentage terms, the declines in exports due to NTBs are the greatest in Belgium, Czechia, Hungary and Slovakia, each at more than 2 percent. In particular, small open countries such as Belgium or Slovakia, whose imports and exports account for a significant share of the gross domestic product, are affected more strongly by NTBs since these countries trade a wide range of products and are therefore impacted much more frequently by protectionist policies. In the case of large countries such as the United States or Germany, their trading of a wide range of products also increases the likelihood of NTBs restricting trade. Furthermore, substantially more potential trade is hindered overall due to the existing higher absolute volume of trade. Since the WTO process has stalled, current bilateral Free Trade Agreements (FTAs) are an opportunity to reduce NTBs and boost trade between countries and regions. For example, the EU has reached a political agreement on an FTA with Japan this year and is negotiating other FTAs with major trading partners in Asia and Latin America. The elimination of NTBs plays an important role in the negotiations. This is a positive development from a trade policy perspective. In the future, however, it would be desirable to address NTBs – analogous to tariff reduction rounds – under the multilateral umbrella of the WTO again. The long-term goal should be uniform regulations and standards around the world in order to ensure fair framework conditions for international competition. Particular attention should be paid to special economic relationships between industrialized countries on the one hand and developing and emerging countries on the other: So less developed countries can benefit more from the international division of labor, industrialized nations should open their markets, possibly also unilaterally, for products from these countries and roll back NTBs. This will require greater willingness to compromise on the part of developed countries. the trend in the direction of a service society, which slows cross-border trade since many service providers are local by nature and therefore make trading difficult internationally. The reduction in the NTBs is only one part of the economic policy challenges to be focused on. The aforementioned aspects should also be taken into account and addressed on a national and international level, if possible.